Gophers can be a serious garden pest if they discover that you are growing things they like to eat. Gophers are partial to root vegetables, such as carrots and parsnips. They spend most of their time underground and eat your root vegetables from the bottom up. In addition, their burrowing can damage the root systems of plants they don't eat. Gophers are burrowing creatures that live on the underground roots and tubers of plants. Many root garden vegetables are ideal food for both gophers and people. This is the cause of most garden conflicts between the two species. If you live in an area that has gophers and don't plan your garden with barriers, gophers may dig under your yard to get to your vegetables. In some cases, gophers may also feed on above-ground plants and vegetables, but they tend not to travel far from their burrows. One indication of gophers in your garden are mounds of soil in and around your yard. These mounds of soil indicate entrances to the gopher's tunnel network. Most gophers dig more than one tunnel, so simply closing one entrance will have little effect on their absence or presence in your garden. Another indicator of a gopher in your garden is disappearing root vegetables, like carrots. If you find that your carrots are disappearing, dig down. If you find a tunnel under the missing vegetables, you likely have a gopher problem. Occasionally, gophers will travel short distances from their holes. If you see eaten plants and a nearby mound of dirt, it is likely caused by a gopher. Gophers tend to not live in urban areas. 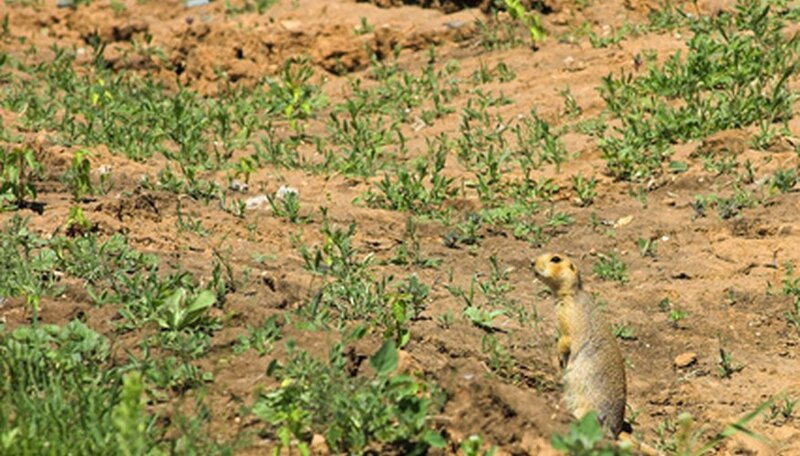 However, as urban areas encroach on natural areas, gophers sometimes find themselves in conflict with people. Gophers are often found on the outskirts of new developments or in smaller towns. Gophers live in the western two-thirds of the United States and are only found in the western hemisphere. They live from sea level up to around 12,000 feet. If you live in an area with a known gopher problem, dig down a couple of feet and line your garden beds with hardware cloth or even wire fencing to stop the gophers from burrowing into your garden. This technique may also help to keep moles and other burrowing critters out of your garden. Planting your vegetables in raised beds is another good way to discourage gophers from consuming your prize carrots. Building the beds at least 24 inches high will also discourage many rabbits from jumping in. However, if you have unusually large rabbits, you may want to build 12 inches higher. By lining the bottom of the raised beds with a barrier, very few burrowing animals will be able to reach your vegetables. If a gopher feels threatened, it will likely move on to another location and leave your vegetables alone. Barn owls are one of a gopher's natural predators. Encouraging barn owls to nest will discourage gophers from entering or remaining near the owl's nest. If barn owls are native to your area, build a nesting box on a 12-foot pole near your garden. If a barn owl moves in, your gophers will likely move out. Keeping dogs near the garden can also discourage gophers. Some small dogs may actually enter their burrows and chase them out. Cats can also be a gopher deterrent. A number of commercial repellents are available and may work to discourage gophers in your vegetables. Some people will claim that human urine, fox urine, or even human hair will repel a gopher. According to Total Wildlife Control, these have no deterrent effect on gophers. In extreme cases, one traditional way to keep gophers out of your garden is to light a fire at one of the holes. The smoke will drive the gopher out of another entrance to its burrow and may discourage it from coming back.